Update: As of December 2016, Basho Café has retired and has reopened as YAMA Cafe. Upon first glance, YAMA looks and appears to function fairly similarly as Basho, as it was taken over by one of Basho’s employees. Here is my review of Basho a few months before they closed. 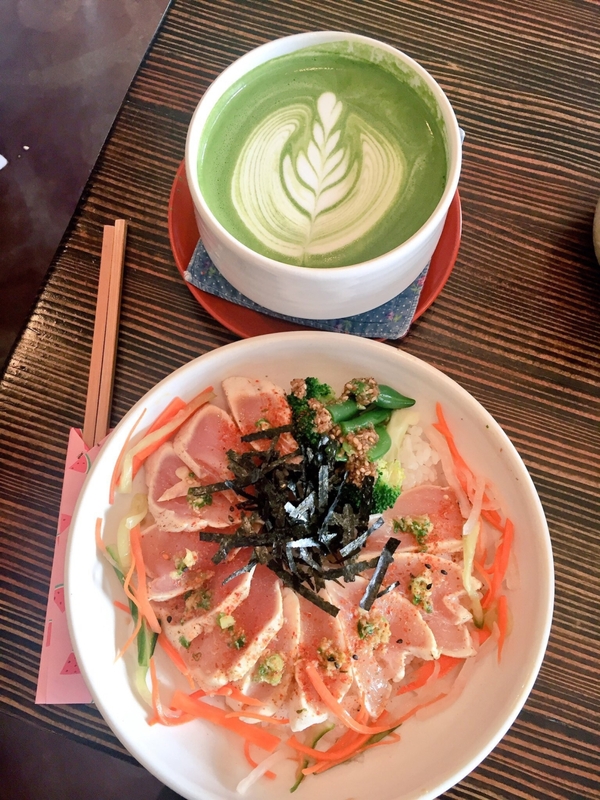 Mix Vancouver’s coffee culture with Japanese aesthetic and attention to detail, and you’ve got Basho Café. I’ve been visiting this little café on East Hastings over the past few years, and my most recent visit inspired this blog post. I’ve always gone to Basho Café for coffee and cookies, but my most recent lunch blew me away. I should have known better to assume the lunch offerings wouldn’t be as satisfying as their Japanese sweets or a meal at a full-menu Japanese restaurant, but I was wrong, and I’m glad I was wrong! Yes, Basho Café serves good coffee (sourced from Vancouver roasters, Moja Coffee), beautiful matcha lattes, and a gorgeous selection of tiny Japanese baked goods. But don’t write off their extremely limited breakfast and lunch items – they’re no less delicious! In this case, Basho Café’s very much quality over quantity. There may be only three items for lunch, but the quality is superior. You’ve got two variations of three dishes: a tuna tataki rice bowl or salad ($11.50), a teriyaki pulled pork rice bowl or salad ($10), or a veggie rice bowl or salad ($8.50). On weekdays, you can turn your meal into a lunch set for an additional $3. The lunch set includes soup, veggies, and a sweet, but they sell out of their lunch sets after 20 orders, so arrive early. The interior is cute and cozy with wooden furnishings and tables topped with potted plants and small bouquets. The attention to detail is everywhere, whether it’s the the fabric coasters under your matcha latte, or the reusable wooden chopsticks wrapped in watermelon motif paper. These only cement Basho Café’s charms. Another observation: the staff at Basho are Japanese and some customers appear to be as well. During my recent visit, a group of women seated next to me were conversing in Japanese while sharing tea and cookies. In Vancouver, where Japanese restaurants are a dime a dozen, this is often a sign of quality. For lunch, my tuna tataki rice bowl was exquisitely seasoned and prepared, served on a bed of perfect rice, garnished with pickled daikon and carrots. A nice treat was the tiny serving of green bean and broccoli gomae. For $11.50, it may be more than neighbouring Japanese offerings, but the quality is superior. I’d argue that my lunch at Basho Café rivals the lunches I’ve had at East Van’s most renowned Japanese restaurants. Ultimately, Basho Café is a neighbourhood cafe that feels like you’re visiting friends in their home. It has limited hours and limited menus, and I would confirm the opening hours before going because they cna change on a whim. However, if you find yourself around Hastings Sunrise and you’re craving a quality Japanese lunch in an adorable cozy environment, you really can’t do better than Basho Café.